This has to be the mother of all theme parks, and in my life, I’ve seen quite a few. 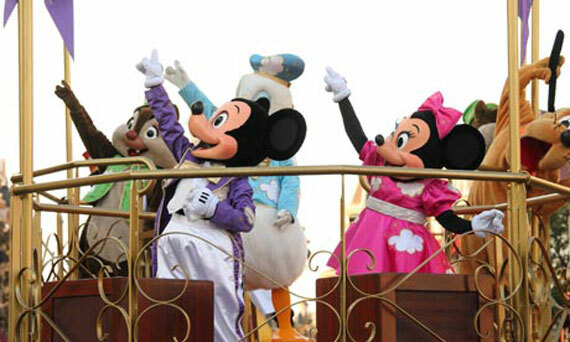 Every child and many an adult’s dream will come true in this magical kingdom of Mickey and Minnie and their friends. In Europe, there is only one Disneyland and it’s only a 10 hour drive or 90 minute flight from Prague, near the city of lights - Paris. This year, it is celebrating its 20th birthday. 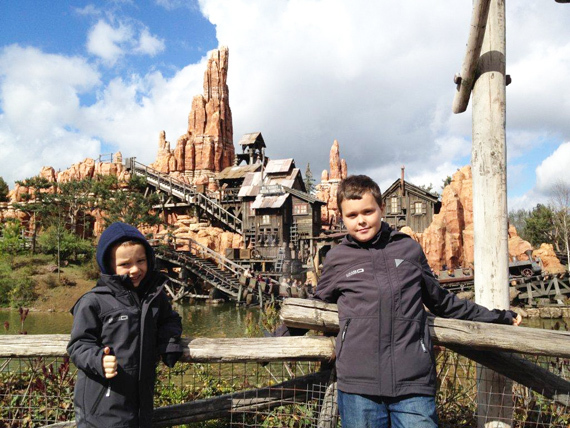 If you have never been and are yet to decide what to do this summer with the kids, then Disneyland may just fit the bill, as you can also combine it with a visit to Paris proper. There are several companies that organize tours to Disneyland out of Prague, but we have never had any experience with these and have simply opted to make our own way over. We usually drive with a stop-over in Germany on the way, but CSA often has very good fares available and it is just as easy (and economical) to fly over. Either way, give yourself at least 3-4 days for such a trip. 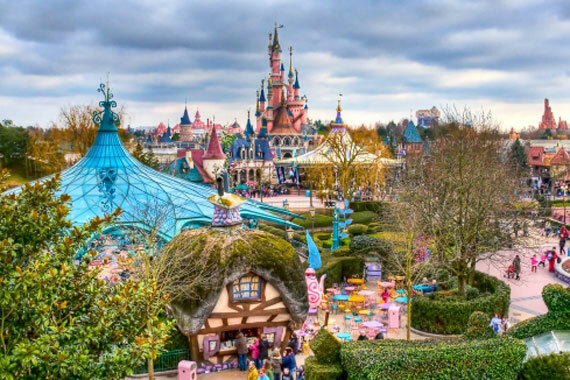 You will also need to decide whether to stay in the city of Paris itself or in one of the many holiday hotels located around the Disneyland Park area. 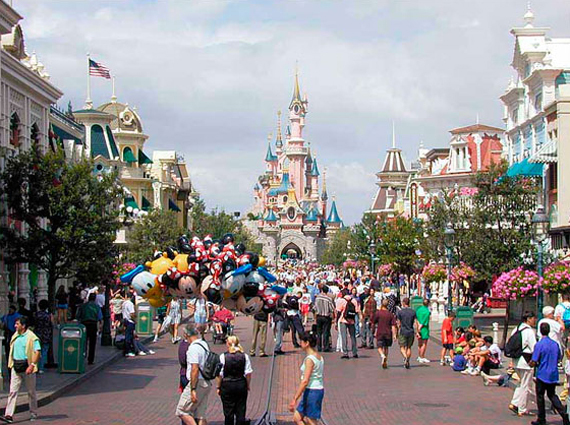 Disneyland itself, is located about 30km east of the centre of Paris and by Metro and the RER train, it will take about an hour to get there. 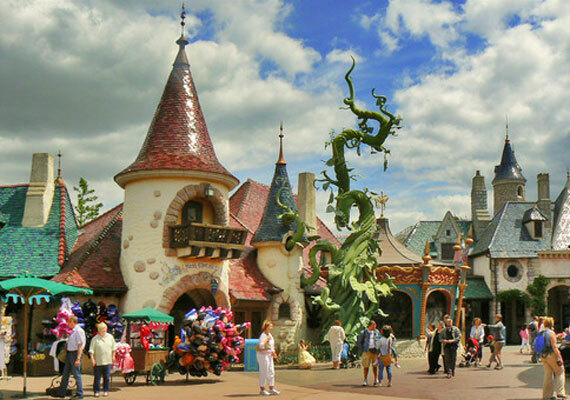 It is very simple and convenient to commute between Paris city and Disneyland Paris but you will need to decide which place you would like to choose as your base. We always generally stay close to Disneyland and if we feel like being a bit more ‘cultured’ for the day, prefer to take trips into Paris proper using public transportation. 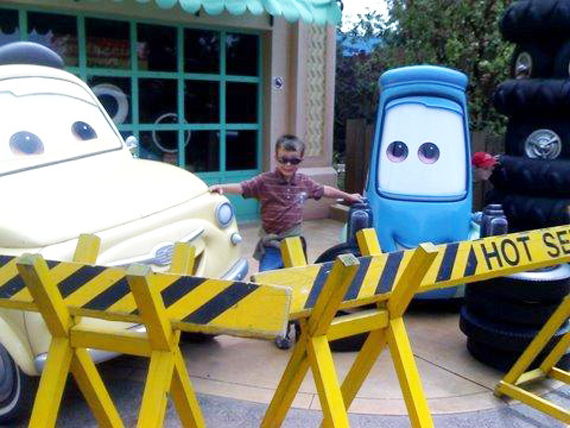 Staying in and around Disneyland however, will keep your kids very happy and entertained. 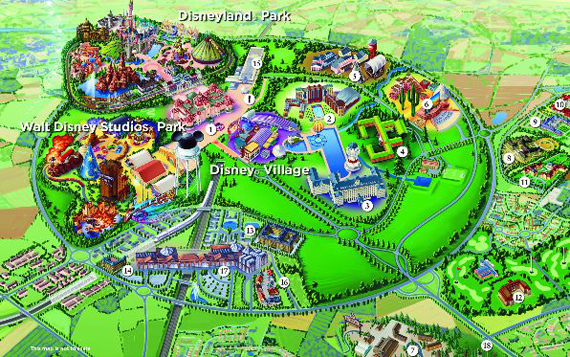 There are actually 2 separate parks - Disneyland Park itself and Disney Studios, which are located right next to each other. 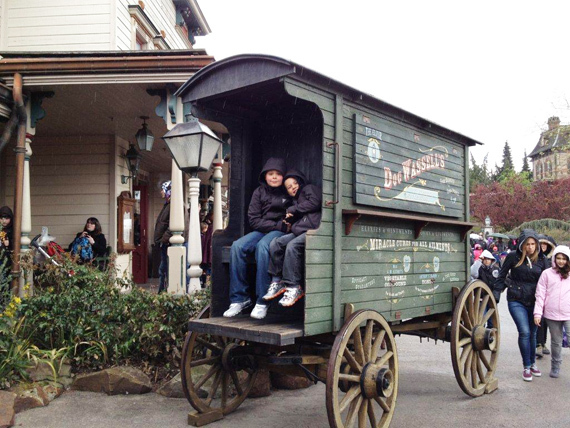 There is also a Disney Village which has many shops, restaurants a cinema complex as well other attractions. It remains open along with Disneyland, more or less 365 days a year (only the Studios often tend to close around 7pm, whereas the park remains open for a lot longer). 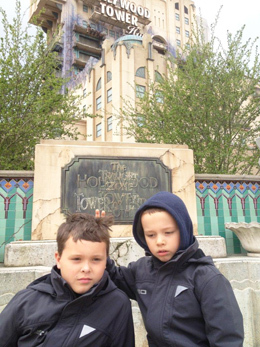 It is best to get a combined ticket that will get you into both the Disneyland Park as well as Disney Studios. To cover all of the rides and other attractions in the Studios will take you at least 3-4 hours (if not more) and there are some great rides not to be missed here. For the very little ones, I would recommend the Slinky Dog ride, Aladdin Magic Carpet ride, the Cars ride, the Stunts Show and Backlot tour, which shows you how movies get made with quite an exciting and ‘watery’ climax. For thrill seekers the Rock ‘n’ Rollercoaster by Aerosmith is a must (it goes from 0km to 100kms per hour in just one second). The Tower of Terror ride will take you up in a lift of a 1930s inspired hotel and then suddenly drop several hundred metres (not for the faint-hearted). Crushes’ Coaster, is another mega roller coaster, based on the film Finding Nemo, that takes you on a whirly ride down the ‘Eastern Australian Current” - it is dark, fast and feels pretty dangerous! If you prefer to take it easy, then there are several movie theatres on site, where they regularly stage various shows such as the art of Disney Animation or the art of cinema. All of these are great fun and educational too. Whenever possible, try to get a FASTPASS for as many of the rides as possible (in both parks), especially if you are visiting during the summer or other European vacation periods. Many (but not all) of the rides have the Fastpass System, which you can have issued by inserting your park entry card (one per person) into a special Fastpass machine, located near each ride that has one allocated to it. The Fastpass will then say the time at which you can go on a particular ride, with a much shorter waiting time. You can only have one Fastpass at a time and no machine will issue you with a second one until the first one has been used up. Also, each park has a board, which shows you the exact waiting time for each ride. In the Studios it is located right in front of the Tower of Terror and in the Park, it can be found opposite the Buzz Lightyear ride in Discovery Land. It can be quite useful, as sometimes the waiting times for a ride can be 60 minutes or more! As for lunch, if you can avoid it, do not eat in the Studios. In my opinion, the food is a bit over-priced (especially the hotdogs) and not as good as what you’ll find in the Park. Also, try not to eat your lunch on Main Street USA of the Park. Move further into the grounds and eat at Frontier Land or Discover Land. The best value for money is (lunch only), Pizza Planet, which is right behind Space Mountain, and gives you unlimited pizza, pasta, salad, dessert and drinks at one set price. It is also in an air-conditioned hall and also has an indoor playground for younger children. If possible, bring your own water bottle, which you can refill throughout the day at the numerous water fountains scattered around the park. Disneyland Park is truly amazing, and is (almost) impossible not to like. The only negative, is the sometimes very long queues which can form, especially during the summer. These can be avoided a little bit by getting Fastpasses, looking at the time-boards or by going on ‘fast-turnover’ rides. The It’s a Small World ride gets a lots more people on per minute than say the Peter Pan ride and hence the waiting time is always a lot less. 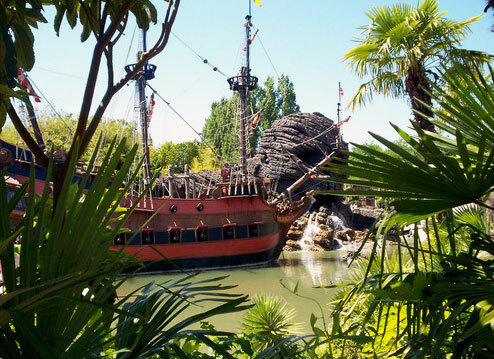 I won’t talk about all of the attractions at Disneyland Park, as there are just too many. They are all quite amazing. Disneyland is no ordinary amusement park. It is a theme park to the core and each ride that you go on, is atmospherically adjusted to the theme that it is portraying. For example, at the Haunted Mansion, staff members wear long, scary-looking capes and are encouraged not to smile too much. At the Indiana Jones ride, you are surrounded by jungle ruins and escorted into the roller-coaster carts by staff dressed up in hats, scarves and khakis just like Indiana. During the numerous daily parades (concluded each night by an evening parade and fireworks), and at all the attractions, English and French are the main languages spoken. All of the employees are at least bi-lingual and always very helpful and friendly. The park is beautiful and spotless and with more than 12 million visitors (from all over Europe) each year, it is more popular than the Eiffel Tower or Notre Dame of Paris! I mustn’t forget to mention the spectacular laser and water show, celebrating the 20th Anniversary of the Park and shown at the end of each day at Disneyland Park, is something that should definitely not be missed! 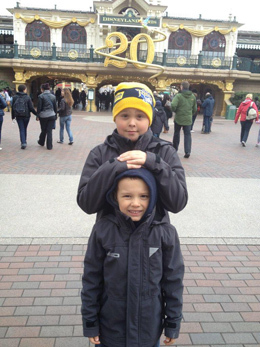 If I could only take my kids to one theme park in a lifetime, then it would have to be Disneyland and living in Europe, it would have to be Disneyland Paris. When: Disneyland Paris is open 365 days per year. Disney Studios: open from 10am until 6 or 7pm each day. Disneyland Park: open from 10am until 10 or even 11pm each day depending on the time of year (check website for precise hours). By plane: Air France (http://www.airfrance.com) or CSA (http://www.csa.cz) both fly between Prague and Paris several times each day. 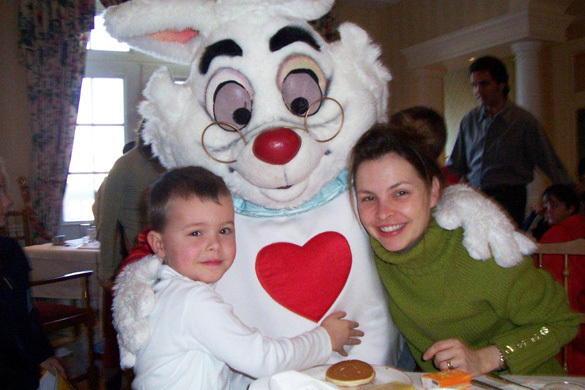 Tickets start from 3000CZK per adult. Book online. There is a regular train service from the airport that goes straight out to the Disneyland Paris area. OR at one of the many various Disneyland resorts located in and around the theme park. Look on the official website for special offers. Here you will find 14 official Disney hotels listed but there are many other options designed to fit almost every budget. 2 Days & 2 parks: 131 (A), 117 EUR (CH). Annual Pass (valid for 320 days per year), 159 EUR per person and it also gives a 10% at most restaurants and gift stores. Dreampass (valid for 365 days per year), 199 EUR.